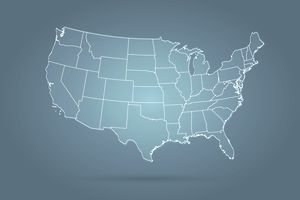 What Is the Average Credit Score By State? Credit scores affect almost every aspect of your life. It's used when you apply for a mortgage, a car loan, or a credit card. Even landlords and cellphone companies take your credit into consideration when you're getting approved. How does your credit score stack up against the people in your state? What about the country? The average credit score across the entire United States was 675 in 2017, according to Experian's 2017 State of Credit Study. The data is based on the VantageScore 3.0, which generates credit scores on a range from 300 to 850. While higher credit scores are obviously better, breaking down the credit score into brackets brings more clarity to specific credit score numbers. Minnesota has the highest average credit score at 709. Mississippi has the lowest average credit score at 647. Alaska has the highest average credit card balance at $8,516, and Iowa is the lowest at $5,155. The national average is $6,354. This is relevant because how people manage their credit card debt often has a lot to do with their credit scores. The rest of the top 10 states with the highest average credit score are: Vermont (702), New Hampshire (701), South Dakota (700), Massachusetts (699), North Dakota (697), Wisconsin (696), Iowa (695), Nebraska (695), Hawaii (693). These credit scores are all considered prime on the VantageScore scale. Consumers with prime credit scores often have an easier time getting approved for credit and will receive more favorable terms when they're approved. However, the difference between 661 and 780 is viewed as large by most lenders, so those on the higher end of the prime scale will fare much better when applying for credit. The other 9 states with the lowest average credit scores are Louisiana (650), Georgia (654), Alabama (654), Nevada (655), Texas (656), Oklahoma (656), South Carolina (657), Arkansas (657), and West Virginia (658). On the VantageScore scale, these credit scores are considered near prime. It may be more difficult to get approved for credit and higher interest rates are more likely. Geography seems to play a role in credit score, based on the data. Seven of the top 10 states with the highest average credit score are in the upper Midwest while 9 of the 10 states with the lowest average credit score are located in the Southeast. Of course, while ​your address is included in your credit report, it isn't a factor in your credit score. Only information directly related to your borrowing and payment habits is included in your credit score. Payment history is the most influential factor in the VantageScore calculation. It's also 35 percent of your FICO score. Age and types of credit used and percent of credit limit uses are highly influential in the VantageScore. Total balances and debt are moderately influential. The least influential factors are Recent credit behavior and inquiries and available credit. Experian also charted information based on generation, which is helpful to show how those from different generations are compiling debt. The Silent Generation encompasses those born between 1925 and 1945, while Baby Boomers were born between 1946 and 1964, Generation X from 1965 to 1979, Generation Y from 1980 to 1994, and Generation Z from 1995 to 2012. Another way to look at it is that generations X and Y include those aged 24 to 53, or those in their prime working years. The oldest members of Generation Z are just joining the workforce, while the youngest Baby Boomers are nearing retirement, and the Silent Generation is retired for the most part. You can work toward improving your credit score no matter where you live. Since payment history is the biggest factor influencing your credit score, paying your bills on time is the best thing you can do to improve your credit score. Catch up on past due accounts and take care of debt collections. Minimize the amount of credit you're using. Having high credit card balances also will bring down your credit score. While it's easier on the budget to pay just the minimum on your credit cards each month, that's not the best thing for your credit. Work on paying down your credit card balances to below 30 percent of the credit limit. The lower the better. Maintaining extremely low credit cards balances will help boost your credit score. This shows lenders that you can handle credit responsibly and not allow it to get out of control. Apply for new credit only as needed. While each new credit card will ding your credit a little, the real harm in opening several credit cards is the risk of running up large balances and missing payments. Minimize the number of credit cards you apply for. Monitor your credit score using a free credit scoring service like Credit Karma, Credit Sesame, or WalletHub. You can stay up to date on changes to your credit score and learn the factors influencing your credit score. You also should review your full credit report each year at AnnualCreditReport.com. Check your credit report to be sure all the information is accurate and dispute any errors with the credit bureaus. An accurate credit report is also key to improving your credit score.